Henry Smart (1778-1823) studied with Cramer and in the earlier part of his life played in the orchestra of the Italian Opera at the Haymarket Theatre. With his brother, the conductor, Sir George Smart, he would have performed many times with Haydn. This sonata is much influenced by Haydn and Arne and may be considered as one of the best classical sonatas for the harp. 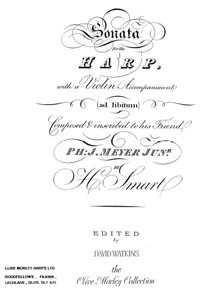 It is dedicated to Phillipe Meyer's eldest son, Philip, a fine harpist who studied with Madame Krupmholtz.